Tactical Casualty Care (TCC) is the delivery of specialized adjunct tactical emergency medical services to casualties of active shooter and terrorism events by first responders from an established EMS system to include, but not be limited to, public safety personnel, EMT’s, Advanced EMT’s, and paramedics as described by CCR Title 22, Division 9, Chapters 1.5 and Chapters 2-4. Tactical Casualty Care EMS providers respond as a medical support service provider to law enforcement incidents and provide field tactical medical care to casualties usually in an area where there is minimal to no direct or immediate safety threat. Medical direction and oversight of the tactical casualty care first responder is provided by the local EMS medical director in coordination with local law enforcement. 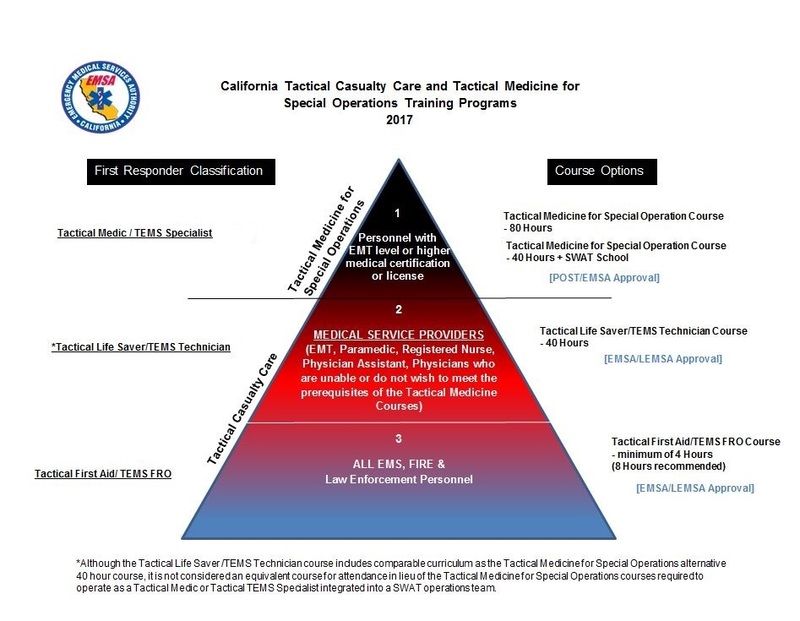 Alternatively, Tactical Medicine for Special Operations is the delivery of specialized tactical emergency medical services to casualties of any active law enforcement incident by law enforcement personnel assigned to a Special Weapons and Tactics (SWAT) operations team, as described by California Penal Code 13514.1. Tactical Medicine for Special Operations first responders respond as an integral part of a SWAT operation team and may provide field tactical medical care to casualties in an area where there is a direct and immediate safety threat. Medical direction and oversight of the Tactical Medicine for Special Operations first responder are provided by a licensed physician in coordination with the local EMS agency as part of an established EMS system. POST is responsible for monitoring and approving Tactical Medicine for Special Operations training programs and courses with input from the EMS Authority. Additional information on the POST Tactical Medicine for Special Operations training and operation program can be found on the POST website at https://www.post.ca.gov. Please contact Todd Frandsen, CTEMS Program Coordinator or Daniel Smiley, Chief Deputy Director.